Nodulocystic acne is a severe form of acne which can result in significant damage to the skin with great impact on quality of life. Oral isotretinoin considered to be the best treatment for such cases. Although it has a high rate of success and its efficacy is well established in the treatment of nodulocystic acne, it may occasionally fail to control the disease. 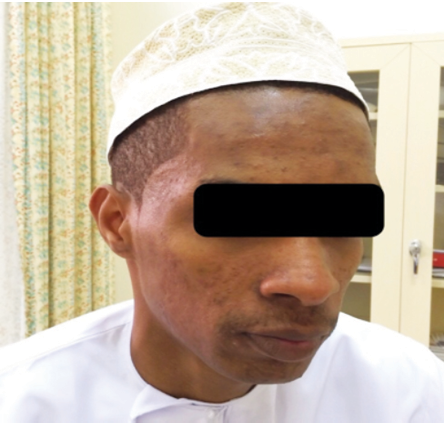 We report a case of a patient who presented to our skin clinic with severe facial nodulocystic acne in which treatment with isotretinoin failed to achieve disease control and caused worsening of his baseline condition. Therefore, oral dapsone was administered as an alternative treatment, and we reached a complete remission of acne lesions within six months. Oral dapsone could be an adequate and safe drug in severe acne, and it might also be a promising and hopeful alternative treatment for nodulocystic acne when isotretinoin fails. Acne vulgaris is a common chronic inflammatory skin disorder of the pilosebaceous unit with multifactorial pathogenesis, variable morphology and a great psychological impact especially in severe forms including nodulocystic acne (acne conglobata). Treatment depends on the type and severity of acne lesions. The available main therapeutic classes are topical and systemic antimicrobials, topical and systemic retinoids, and systemic hormonal therapy. Systemic isotretinoin is the best option when other treatments fail. Even though it is a very effective potent drug, it has been implicated in numerous reports that describe a wide range of systemic side effects. Moreover, it could result in worsening of acne lesions, up to an extremely serious form of acne known as acne fulminant, characterized by systemic symptoms, including fever, weight loss, myalgia, and arthralgia. However, when the available treatments fail to control the disease, oral dapsone could be an effective and useful alternative therapy for nodulocystic acne. Here, we review a case of a patient with severe nodulocystic acne not responding to isotretinoin who was successfully treated with oral dapsone. 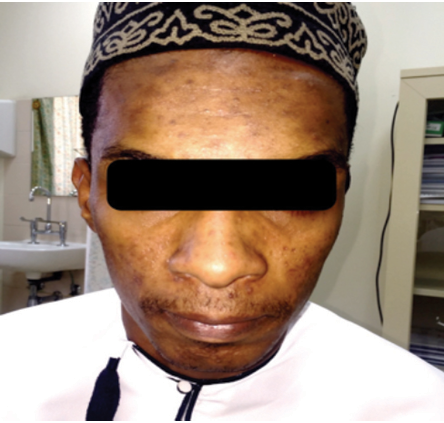 A 21-year-old Omani male referred from a private clinic to our dermatology outpatient clinic with a clinical picture of nodulocystic acne affecting his face. He had been on isotretinoin for two months, but his acne lesions became worse and more extensive. His past medical history was unremarkable, and he had no comorbidities. Examination revealed a young male with normal vital signs and extensive papules, nodules, and cystic lesions on his face [Figure1]. Figure 1: Extensive facial papules, nodules, and cystic lesions. Figure 2: Resolution of nodulocystic acne after six months of treatment with oral dapsone. Figure 3: At one-year follow-up, no recurrence of nodulocystic acne was observed. Biochemical profiles at presentation were within normal range. Culture and sensitivity test using a pus swab sample showed no bacterial growth. The patient completed two months of isotretinoin 40 mg/day (0.6 mg/kg) at a private clinic, with no significant improvement. Once he was referred to us, the dose of isotretinoin was increased to 60 mg/day (1 mg/kg), and he took a short course of prednisolone for two weeks. The condition showed mild improvement of lesions at the beginning and a flare after cessation of prednisolone. Isotretinoin was then given alone for two weeks, but unfortunately, the patient stopped the treatment as he could not tolerate some of the side effects (severe myalgia, conjunctival congestion, and severe dryness of eyes). During the next follow-up, a low dose (10 mg daily) of isotretinoin was started along with a gradually tapering course of prednisolone over three months. Initially, the patient showed great improvement; however, his lesions got progressively worse with tapering of prednisolone. Because of unresponsiveness to isotretinoin and long-term use of prednisolone, these treatments were stopped, and the patient was started on systemic antibiotics and topical treatments which yielded the same results. Finally, oral dapsone was introduced along with topical benzoyl peroxide (BPO) 2.5%. Laboratory tests including complete blood count and glucose-6-phosphate dehydrogenase (G6PD) were performed before starting and during treatment with dapsone and were within normal range. Dapsone was given for a total period of six months, initially 100 mg daily for four months then 50 mg daily for another two months. After six months, clear improvement of lesions was noticed, and good control of condition was achieved [Figure 2]. Follow-up after one year showed no recurrence, except for few occasional acne lesions which were controlled with BPO 2.5% gel [Figure 3]. Based on our report and existing literature, it is worthy to highlight that oral dapsone could be an effective alternative to isotretinoin in severe acne refractory to isotretinoin and other systemic drugs provided that close monitoring of laboratory blood tests are performed regularly, because of the potential systemic side effects. Nodulocystic acne is a severe form of acne affecting face, chest, and back. Systemic isotretinoin is a well-established treatment for severe acne, and it is superior to any other therapy. Nevertheless, we may consider using oral dapsone as an alternative therapy for severe acne when isotretinoin and other topical and systemic treatments fail to achieve disease resolution. Knutsen-Larson S, Dawson AL, Dunnick CA, Dellavalle RP. Acne vulgaris: pathogenesis, treatment, and needs assessment. Dermatol Clin 2012 Jan;30(1):99-106, viii-ix. 2. AL-Shidhani A, Al-Rashdi S, Al-Habsi H, Rizvi S. Impact of acne on quality of life of students at Sultan Qaboos University. OMJ 2015;(30)1:42-47. 3. Zouboulis CC, Bettoli V. Management of severe acne. Br J Dermatol 2015 Jul;172(Suppl 1):27-36. 4. Zaenglein AL, Pathy AL, Schlosser BJ, Alikhan A, Baldwin HE, Berson DS, et al. Guidelines of care for the management of acne vulgaris. J Am Acad Dermatol 2016 May;74(5):945-973.e33. 5. Titus S, Hodge J. Diagnosis and treatment of acne. Am Fam Physician 2012 Oct;86(8):734-740. 6. Rigopoulos D, Larios G, Katsambas AD. The role of isotretinoin in acne therapy: why not as first-line therapy? facts and controversies. Clin Dermatol 2010 Jan-Feb;28(1):24-30. 7. Wozel VE. Innovative use of dapsone. Dermatol Clin 2010 Jul;28(3):599-610. 8. Wozel G, editor. Dapson—Pharmakologie, Wirkme- chanismus und klinischer Einsatz. Stuttgart (Germany): Georg Thieme Verlag; 1996. 9. Debol SM, Herron MJ, Nelson RD. Anti-inflammatory action of dapsone: Inhibition of neutrophil adherence is associated with inhibition of chemo-attractant-induced signal transduction. Journal of Leucocyte Biology 1997;62(6):827-836. 10. Wozel, VE, Barth J. Current aspects of modes of action of dapsone. International Journal of Dermatology 1988;27(8):547-552. 11. Stotland M, Shalita AR, Kissling RF. Dapsone 5% gel: a review of its efficacy and safety in the treatment of acne vulgaris. Am J Clin Dermatol 2009;10(4):221-227. 12. Didona D, Paolino G, Donati P, Muscardin LM. Resolution of nodulocystic acne with oral dapsone. Dermatol Ther 2017 Jan;30(1):1-2. 13. Wakabayash M, Fujjmoto N, Tanaka T. Usefullness of dapsone for ther treatment of Asian severe acne. J Dermatol 2013;40(6):502-504. 14. Prendiville JS, Logan RA, Russell-Jones R. A comparison of dapsone with 13-cis retinoic acid in the treatment of nodular cystic acne. Clin Exp Dermatol 1988 Mar;13(2):67-71.